The Spring Arts Gallery is located at the entrance of the collective and hosts shows throughout the year with outside artists as well as the collective artists. The hours of the Spring Arts Gallery are the same hours as the Last Bookstore, however, the individual artists' shoppes and studio hours vary. The best time to visit when all the artists are there is on Saturday from 1pm - 5pm and during the DTLA Artwalk (2nd Thursdays each month) from 7pm - 10pm. Several parking lots are available nearby as is the Pershing Square Metro station. Simply walk to the corner of 5th and Spring streets and enter The Last Bookstore on 5th Street. 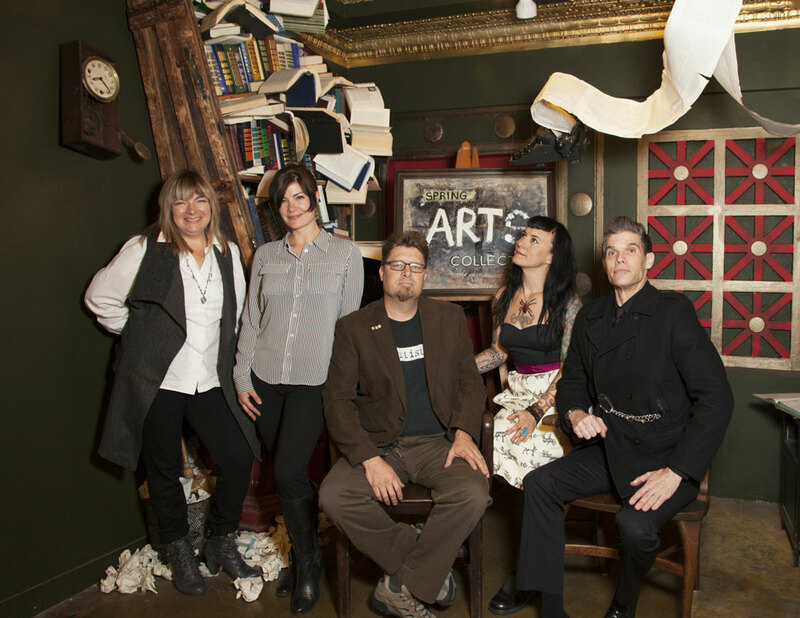 Walk upstairs to the mezzanine level and you'll see the Spring Arts Collective. 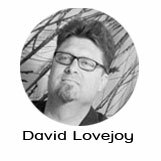 David Lovejoy (Lovejoy Art) has been working as a maker and designer since the early 1980's where he started off with a successful graphic design career that led to a long arts education at several schools and studios where he focused mainly on ceramics. 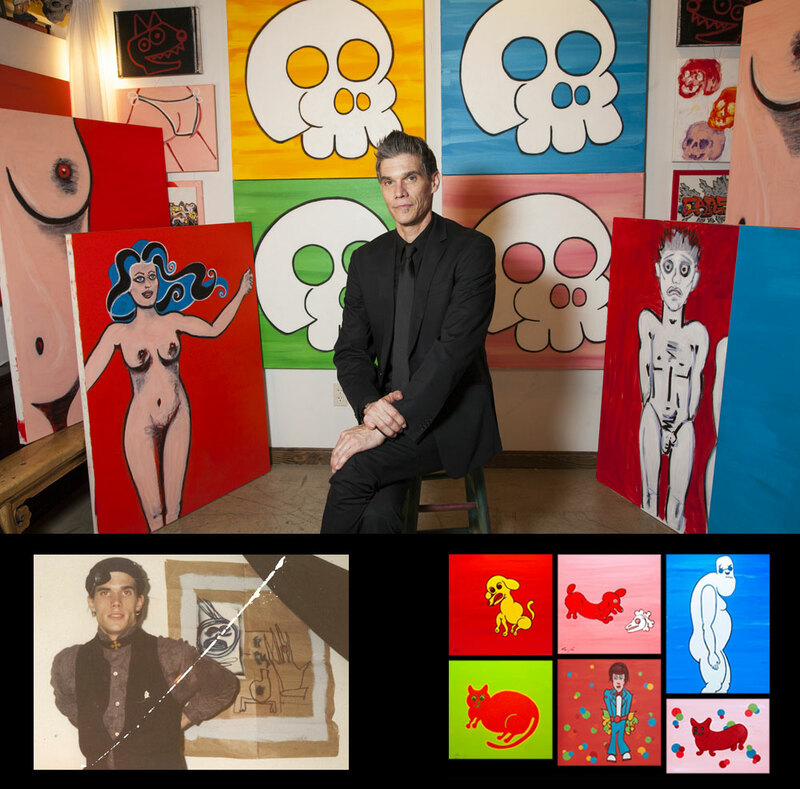 Amongst other awards, in 1993 Lovejoy was named one of the "Art Stars of California" by Art in California magazine. More recently, he customized a 1962 Airstream trailer for an upcoming National Geographic expedition to the South Pole housing Steve Wozniak and Buzz Aldrin. And in downtown Los Angeles, he was commissioned for "Walk / Don’t Walk" in the Spring Arts Tower and he designed the interior surface and the lobby chandelier in the Broadway Arts Building. He was also commissioned to create the "Willow House" at the Natural History Museum of Los Angeles County for their Centennial Garden. 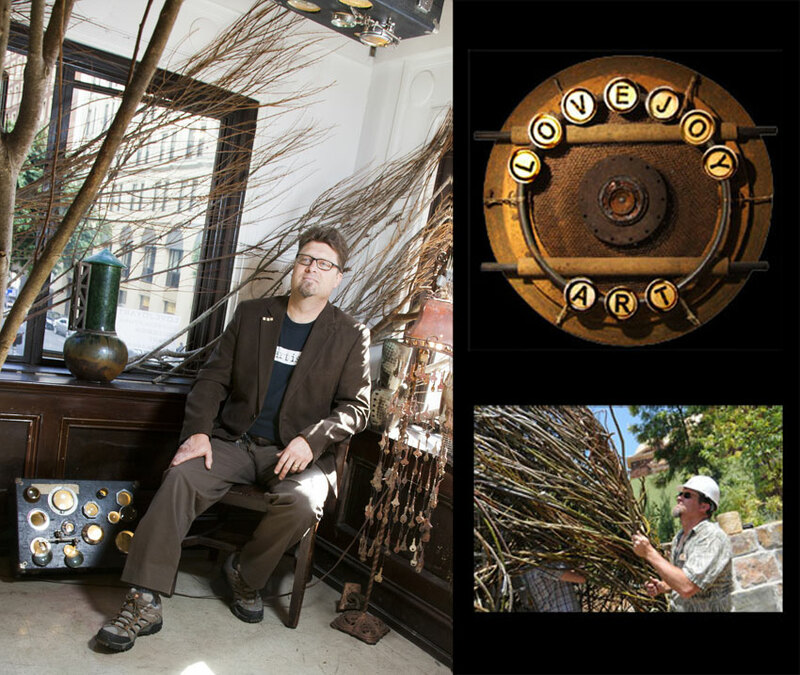 Lovejoy's recent works include assemblage and installation art and his creations have been exhibited in galleries and museums in California, Hawaii and Oregon and can also be found in collections in the U.S. and Europe. "My assemblage work comes from an appreciation of older materials. I like things from the 1930's and 40's and the craftsmanship and design from that era. I'm drawn to parts that have been handled for years, yielding the smooth, time-worn patina of use -- old tool handles, control knobs, chair arms – they all share a familiarity and comfort with me that shows through in my work. I often use old wooden picture frames in my work, and when I do, I use them backwards. Intended to hang against a wall and never be seen, picture frame backs bear the marks of their making – measurements, notations, fingerprints. I like highlighting the craftsmanship and these inadvertent artifacts. My influences are: Dave Brubeck, John Muir and Carl Zeiss." 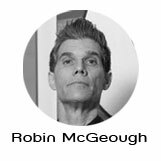 Robin McGeough (Dove Biscuit Studio) is a Los Angeles based artist that has shown pieces at the Think Tank Gallery, Jones Coffee House, and most recently in Dove Biscuit gallery where he regularly shows a collection of downtown LA's freshest talent. 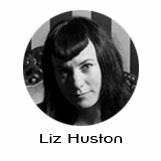 Liz Huston Liz Huston may live in Venice, California, a place known for interesting characters, but it's in Huston's imagination where the truly unique characters exist. Entirely self taught, Huston's work has evolved over two decades from a traditional film background into digital assemblage, photomontage, and currently into mixed media through combining acrylics, oil and watercolors with her digital works. 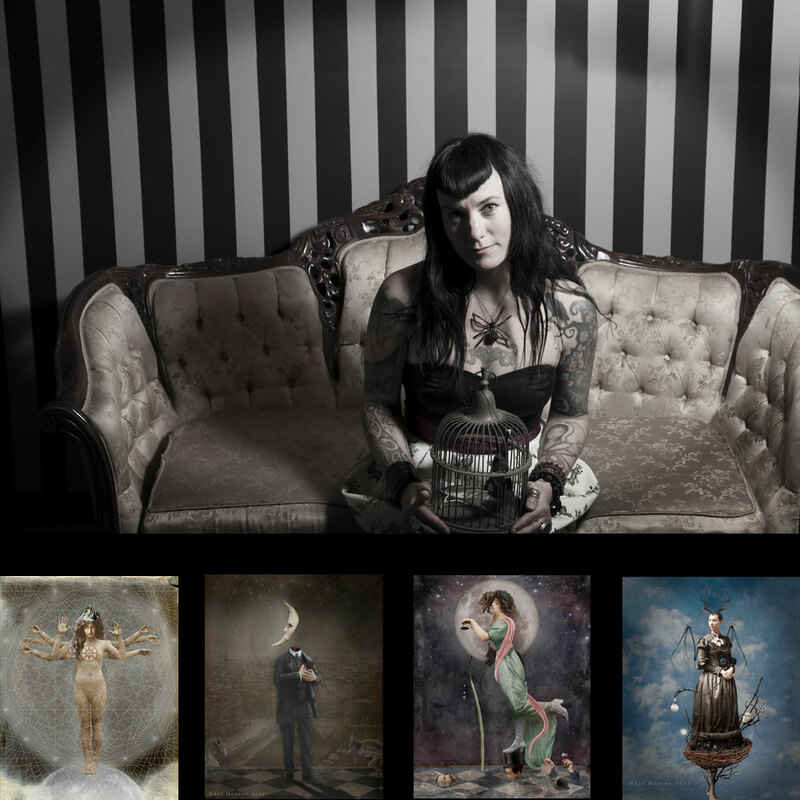 In her complex imagery, Huston creates an esoteric narrative that hints at a logic far beyond the average and mundane. Huston was a featured photographer in Juxtapoz Magazine, and was named one of "Photographers You Should Know" by Rangefinder Magazine. "I am inspired by a variety of mediums: art, photography, poetry, music, daydreams, conversations and observations. The paintings of Gustave Moreau, Remedios Varo, Leonora Carrington, Eugène Carrière inspire me like no other. The photographers who shaped my eye are Eugene Atget, Julia Margaret Cameron, Man Ray, Joel-Peter Witkin, Anton Corbjin. Some of my greatest inspiration comes from the music of Nick Cave, DeVotchKa and Explosions in the Sky. Although I am a visual artist, I would be lost without the written word, especially the writings of Neil Gaiman, Erica Jong, Elizabeth Gilbert, Rumi, Ovid, and myths from all lands." 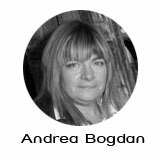 Andrea Bogdan (Zero-4 Gallery) generously uses color and motion in her paintings to express the unique, life spark of the people she meets and the weird, wonderful and conflicted nature of the human condition. She's worked in Detroit, the Bronx, Manhattan, Dallas, Prague, Vienna and Los Angeles, and she extracts personalities for her artwork mainly from these places. Andrea's work is influenced by these artists: Marc Chagall, Ralph Steadman, Wassily Kandinsky, Paul Klee, Theodor Seuss Geisel, Alexander Calder and (most of all) Jesse Reno. People who like her work have also referenced John Altoon and Carl-Henning Pederson. "I paint the human spirit: Bliss, mischief, victory, freedom, determination, sorrow and individuality are common in the beings I create. They are imperfect souls tethered to earth, caught in a sweet moment in time with their blemishes exposed. They are embarrassed, courageous, vulnerable, expectant, powerful, embattled, and satisfied, and we see it and we see it and we know how it feels because we are human too." "I paint the pursuit of happiness." 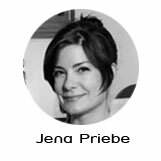 Jena Priebe (Fold Gallery) has been involved in assemblage sculpture, installation work and functional art since 2001 and has been showing professionally since 2007. She uses a myriad of media -- mirrors, glass, antiquated found objects, metals, acid, adhesives and the guts of machines -- things that have been bartered for, haggled over, things unearthed in a forgotten family attic or pulled from the depths of tangled industrial salvage yards. Having grown up a remote, rural part of Michigan, her farm was a place where few things were ever thrown away, a place where old, found objects were coveted for further use. And she now creates art out of a juxtaposition of organic elements, like paper, leather and textiles, along with mechanical or industrial elements such as computer innards, gears and rocketry parts. These elements combined speak volumes about times past, present and future. "I create my art from a place of joy. It usually starts with something delightful that I see that draws me in, making my hands ache to play with it and transform it. I see the potential in things. Things are usable and I upcycle them and enjoy their potential. I like to tell a story of where we’ve been and where we may be going. I like to challenge our needs as humans to consume as well as our obsession with technology. This is what truly drives my work. 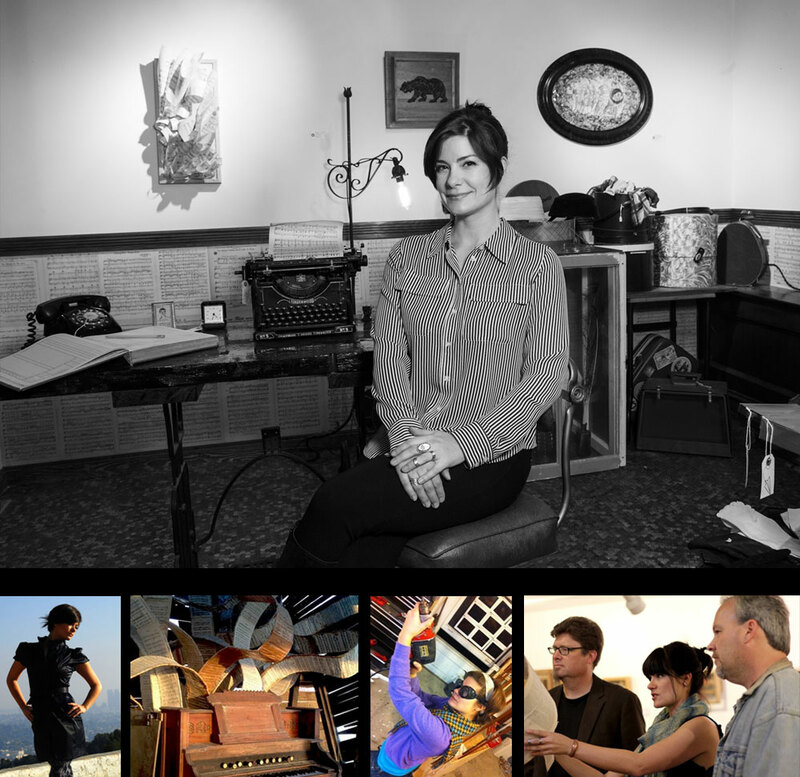 I'm inspired by artists Alice Aycock, who broke down so many barriers for women sculptors; Jules Verne for his never ending imagination, and Joseph Cornell for his magical Assemblage and infinitely well organized artist materials."